Posted on Tuesday, November 27th, 2012 at 5:26 am by Pieter van der Westhuizen. You know, I love working for Add-in Express! I think there are few companies that cover so many interesting things to write about. 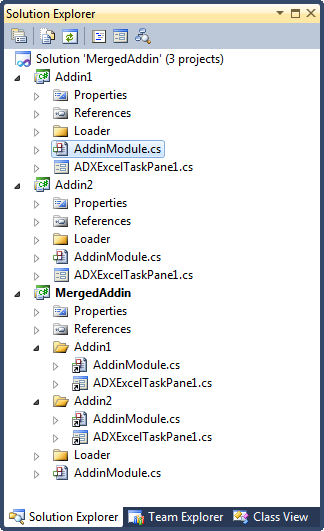 Take this article for example, Eugene asked me to write an article on how the Add-in Express team merged a number of add-ins into one assembly when they build the AbleBits Excel Add-ins Collection. When I first heard about this topic, I had no idea how to even tackle this problem. Fortunately, one of the perks of writing this blog for Add-in Express is access to the best MS Office developers in the world, and Aleksey send me a sample project. Phew! Before we have a look at the sample project, let’s first examine the scenario for when you might want to consider using this approach. In the case of the Ultimate Suite for Excel, loading was a crucial factor, by following this approach the team effectively reduced the loading time by nearly 60%, because only one assembly needs to be loaded instead of 20+ separate ones. Now if you ask me, a 60% speed increase is definitely worth-it! 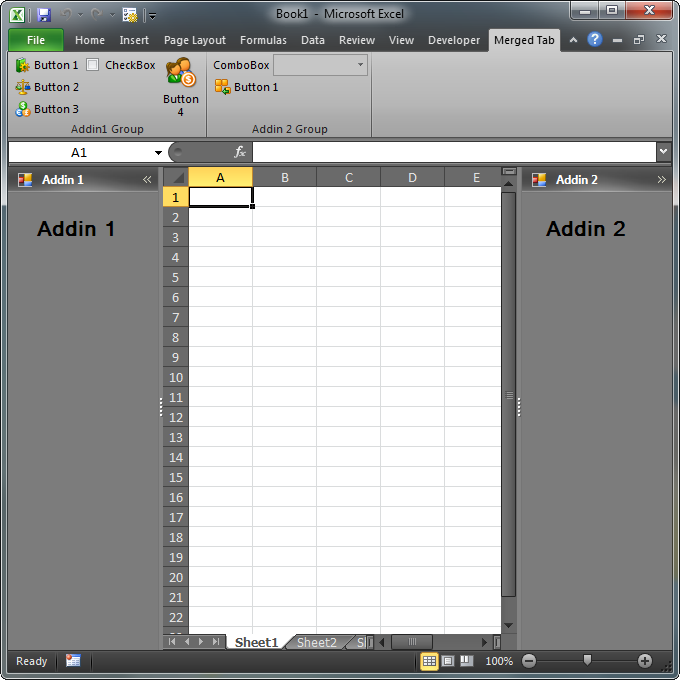 In this example, we’ll have two separate Microsoft Excel add-ins. One will have a custom Ribbon Tab including a Ribbon group with a few buttons and a custom Excel Task pane. The other add-in will have a custom Ribbon Tab, custom Task Pane as well as some keyboard shortcuts and an Excel App Events component. Before we can merge our Excel add-ins we need to create another plug-in which we’ll use to combine all the elements of the other add-ins. 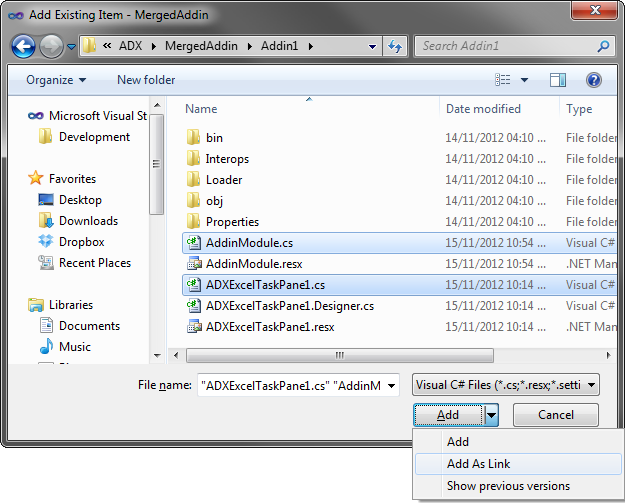 Right-click on the Addin1 folder and select Add > Existing Item… Browse to the Addin1 project folder and select AddinModule.cs and the task pane class, in this example it is called ADXExcelTaskPane1.cs, and click the arrow on the right hand side of the Add button and select Add As Link. Since we’re merging our Excel add-ins we have to combine things like Ribbons tabs into a single Ribbon Tab and command bars into a single command bar. To do this, you need to add an empty ADXRibbonTab and ADXCommandBar control to the MergedAddin project’s AddinModule designer surface. We’ll add all the modules we need to merge to this collection and loop through each module’s components and add it to the MergedAddin project’s components. The BindEvents method does exactly as its name suggests and will bind the events of the source component to the destinations component in the MergedAddin project. Now, when you run your project you should see the UI elements of the two Excel add-ins combined into one. There you have it! With a little bit of the Add-in Express teams’ know-how and some innovation you do not need to rewrite your add-ins to combine them into a single binary. C# sample project for Excel 2007-2013.
thanks for the article, I am also looking to merge modules but with word and this has proved very interesting. I do have a question though, if I wished to also use the parent project for common functionalities how would I go about it ? Normally, I would add a refernece to the parent project and a using to access these methods but in this case with the links, VS sees double. I think that the combination of the link and the reference create a ciruclar reference. To share common functionality between your parent project and for example other projects in your solution, you would ideally have to strip out the common methods etc. and place them in a separate project. This way you can add a reference to it from the parent project and any other project in the solution and avoid any circular references. It almost sound to me that you want to separate certain functionality in your project? Maybe try using a COM Add-in Additional Module… Have a look at the “Creating modular Office add-ins using Add-in Express” article, it should shed some light. Thanks for the advice, I completely agree with the stripping for a common library, it seems the best way for the common methods etc. And thanks for the link, the modular project is exactly what I am looking for, I will implement that today and see how I go, the key part or me being that I can have my separate modules but also that they share a ribbon/command bar. I have an error with InitializeComponent when i merge two addin with task pane. It seems like a protection level error. I’ve tried to add a namespace for my addin 1 (namespace : addin1) and for my addin 2 (namespace : addin2) with no results. Can you share some more detail about the error you get, please? In the end I tried both of your suggestions and the method in this article proved the better choice for us. Although, I am now having the issue that if I click a button in one of my added modules, the CurrentInstance and the hostApplication for this module returns null. I wanted to know how to merge 2 addins (addin1 and addin2). Both of them contain a single taskpane(and have the same name), an addinmodule with a taskpanemanager. InitializeComponent() in both Addinmodule is unaccessible (of course, it’s declared as private). Can you send a sample add-in that causes the same problem to the Add-in Express support email, please? It’ll make finding the problem easier. Can you send the project that gives you the error to our support mail? Will be easier to find the problem that way. Let’s say Addin1 has a ribbon button with an onclick event that calls an “ExcelApp.Calculate()”… In this scenario I am getting an exception because HostApplication is null for Addin1. The same happens if I have any reference to ExcelApp in Addin2, HostApplication -and therefore ExcelApp- is null. However, MergeAddin’s HostApplication/ExcelApp works. But, how do I reference it in any of the “sub-addins”? I have used my project and the sample project provided with this article and I have this same issue in both. Mmm…not sure on why you’re seeing this problem. Would you mind sending your test add-in to out support e-mail? It’ll be easier to track down the problem if I see your code. Thank you for sending the project. What is the reason behind having Addin1 and Addin2 added to MergedAddin as a link? Why not added as a reference in MergedAddin to the Addin1 and addin2 projects? Why would this not work? It’s because the source code of 2 add-ins (Addin1 and Addin2) is required for MergedAddin to be built. Adding only references won’t work, since we take both source codes and combine them in the new add-in.